Hi everyone! Chrissie here today! The Counting Blessings Collection has truly gone down as one of my favorite collections. Not only do I love all of the Autumn inspired stamps and sentiments, the positive sentiments make me so happy. I love making random cards for friends, family and co-workers for no reason at all. It can really make someone's day to give a card to say hello or to give a bit of encouragement. 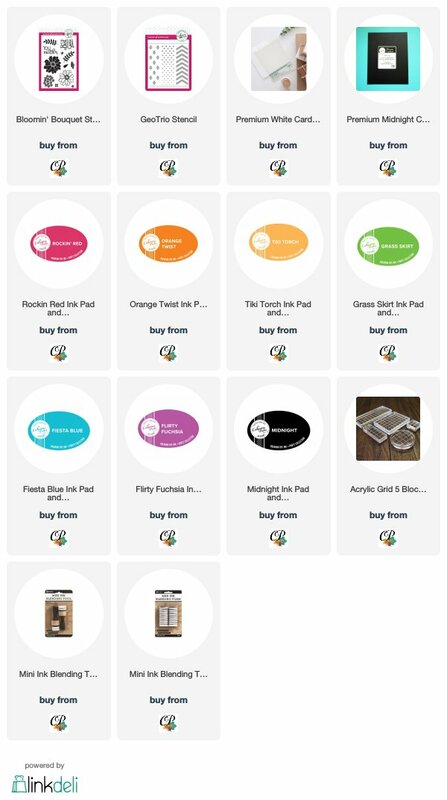 With this collection, there are so many options to do just that! 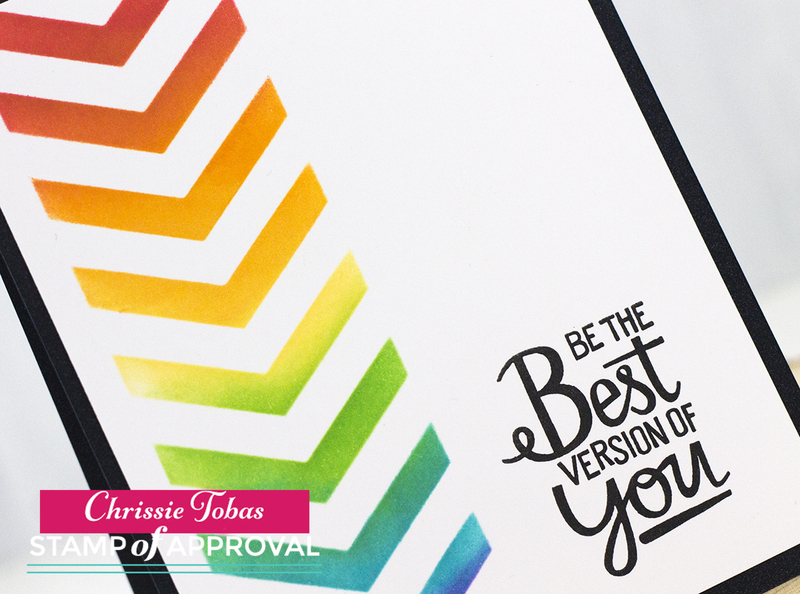 Since I wanted to make a bright and happy encouragement card, I went with a rainbow theme. 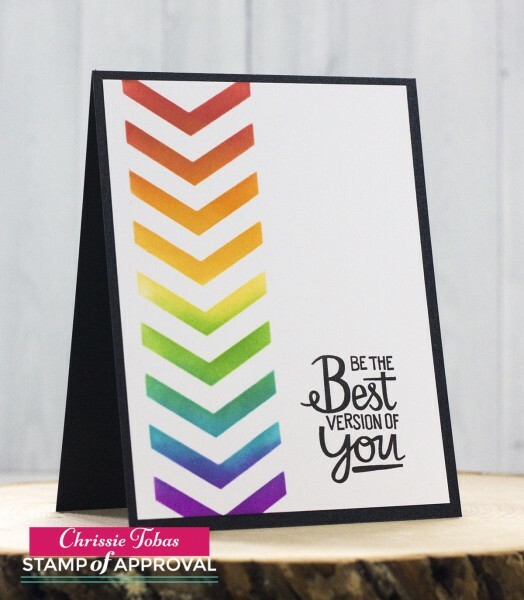 By using Catherine's inks along with the Geo Trio stencil, I created a beautiful chevron rainbow! I secured the card panel down (trimmed to 4 x 5.25 inches) onto a protected surface with washi tape. Then I placed the stencil over it and also secured it down. You may also want to add a sheet of typing paper to protect the rest of the card. Since the ink should only stay in the stenciled chevron area, it's easy to accidentally blend all over the place and get ink on the white parts of the panel. I blended from top to bottom, using a circular motion, in this order: Rockin' Red, Orange Twist, Tiki Torch, Grass Skirt, Fiesta Blue, and finally, Flirty Fuchsia. Once I was satisfied with the rainbow, I stamped the sentiment in Midnight ink. Remember, when using Midnight, just give your stamps a love tap. The ink is really juicy and covers incredibly well. It will stain your stamps, but I am perfectly fine with that. That way, I don't lose them on my desk! I simply assembled the card by creating a card base out of Black Shimmering Cardstock. I trimmed it to 4.25 x 11 inches and scored it at 5.5 inches. This made a top folding, standard-sized card. I adhered the front panel onto the base using a strong tape runner. Thanks for stopping by today and thank you to Catherine for having me guest! Have a great day, everyone!! !